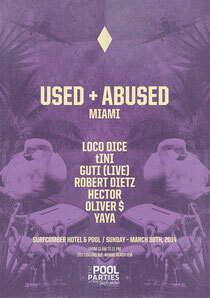 Loco Dice's USED + ABUSED event series hits the Surfcomber Hotel on Sunday 30 March. Featuring an all-star cast of artists that played at USED + ABUSED in Ibiza in 2013, the event is set to re-create the open-air atmosphere of last summer. Running all day from 11am – 11pm the event plans to make the most of the Miami sun to provide the ideal mix of heat and beats. 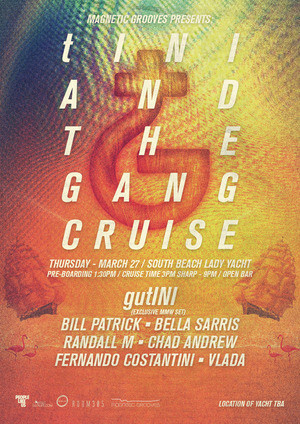 tINI is also setting sail with her tINI & the Gang event series hosting a daytime boat party on Thursday 27 March. The event will continue to provide a platform to upcoming talent as many artists from the 2013 Ibiza series are set to join tINI in Miami. With the highlight being an exclusive gutINI performance (Guti & tINI), this could be one not to be missed this MMW. You can also catch Loco Dice, tINI and Guti at a host of other events this MMW. Running all day from 11am – 11pm the event plans to make the most of the Miami sun to provide the ideal mix of heat and beats. You can also catch Loco Dice, tINI and Guti at a host of other events this MMW.